“showcasing the rich culinary heritage of the South and featuring the finned, scaled and shelled treasures of the West Coast of India - cuisine from the homes of the Malayalees of Kerala, Bunts of Mangalore, Coorgis of Karnataka and the Portuguese of Goa”. 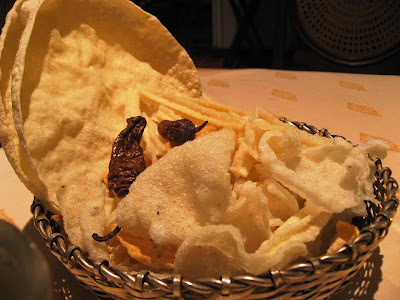 As I went through the menu, a platter of papadums were put in front of me along with a variety of chutneys. I ordered a hot glass of rasam instead of a drink. 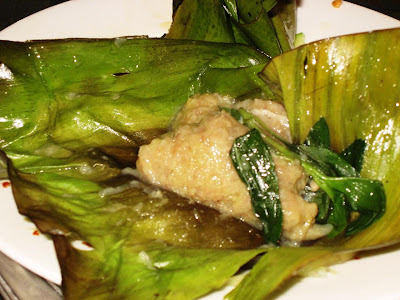 I began with Manji Kolavaithina, a whole white pomfret marinated with green chilly, ginger, lemon which is wrapped in a banana leaf and baked. This was excellent stuff! Lots of flavour and taste, but mild compared to my hot, spicy rasam. The Allepy Fish Curry, with pieces of pomfret simmered in a spicy, tangy gravy was finished in coconut and was delicious with the appam and malabar paratha. 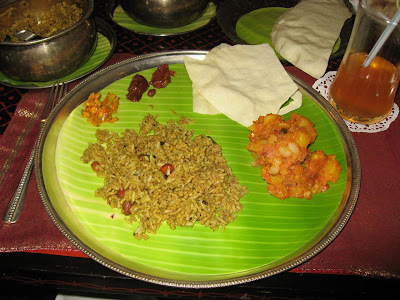 As you can see, I stayed with delicacies from Kerala this time. I finished off with a warm dessert made of rice flakes in a creamy jaggery base with shredded coconut and garnished with slivers of almond. 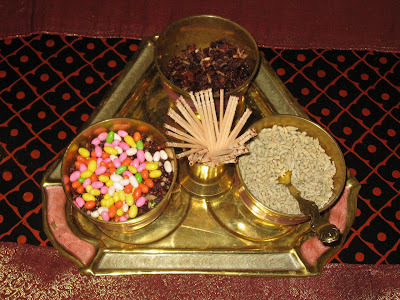 If I remember correctly, this dish is called Bellam Paramannam and is used as an offering to the Gods. The flight to San Francisco via Singapore was eventless. The business class section was only half full. They handed us a package with a single-use thermometer, gloves and a surgical mask to use - the only swine-flu effect I saw during this trip so far. 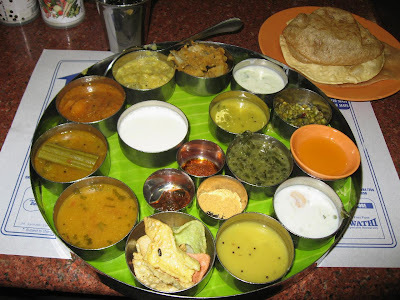 South Indian cooking is set apart by its unique combination of spices, freshly grated coconuts, curry leaves, tamarind and chillies - lot of them! 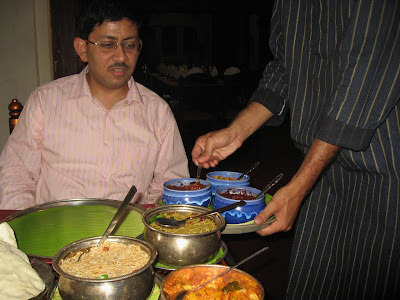 During this trip and the last one in March, I had a chance to sample more Chennai goodness. 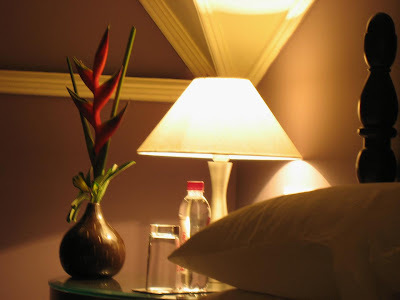 One evening, a friend took me to Fisherman's Cove, a lovely seaside resort hotel on the outskirts of Chennai. A cool ocean breeze blew in from the Bay of Bengal as we chatted away over cocktails at Baypoint View, a seafood restaurant and bar that is right on the beach. 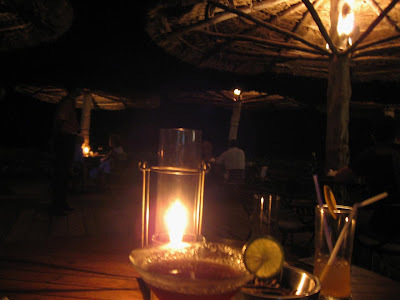 The flaming torches, crashing of the waves and wooden umbrellas over the tables gives this place oodles of atmosphere. Dinner was wonderful here, as much for the food as for the surroundings. The Snapper grilled in South Indian spices and vegetables was awesome. The chef uses a light hand with the spices bringing out the best in the fresh catch. 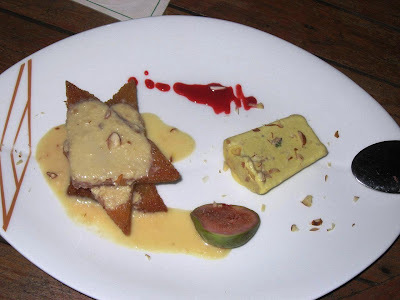 My friend chose the tri-chocolate mousse for dessert while I settled for the shahi tukra with kulfi. Yummy! Zamindars were powerful landlords during Mughal and British rule; they lived off the lands they managed and held sway until Independence. These zamindars were known for their power and status. They lived life to the fullest, in extreme comfort which obviously includes the best of food and wine. 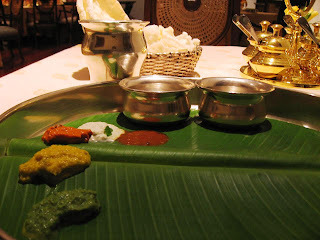 Zameendar, a restaurant in Anna Nagar, celebrates the spicy cuisine of Andhra Pradesh and takes us back to those times. The interiors are simple with segregated seating areas, large tables, and fast-food type paper napkins on the table. We started with a platter of starters that included chilly chicken, mutton sukha, and pepper chicken. The pepper chicken and mutton sukha were very good! 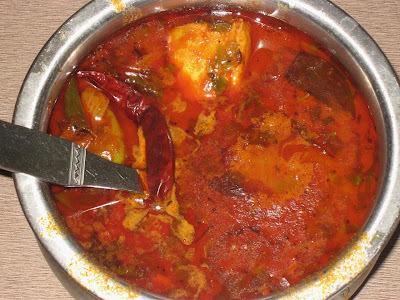 We then moved to a very spicy, red Andhra fish curry called the Nellore Chepalla Pulusu. 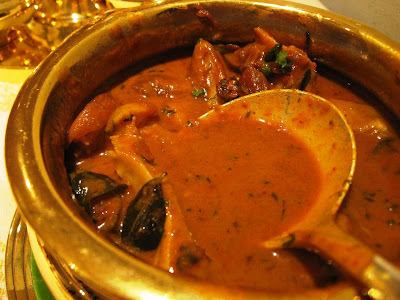 I liked this one because it was so different from the regular fish curries. It had a tangy, hot and very satisfying taste. The fish was very fresh too - they say they only keep the freshest fish and don't use refrigeration here. 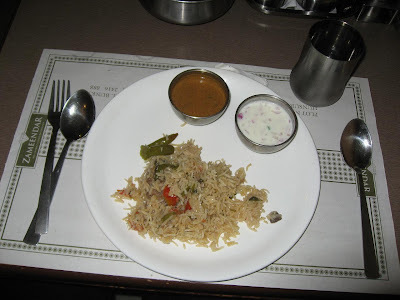 Finally, we had to taste their most popular dish, the Nellore Mutton Biryani. The biryani was served with a cucumber-tomato raita and some kurma-gravy. Great stuff, and with a definite Andhra touch. 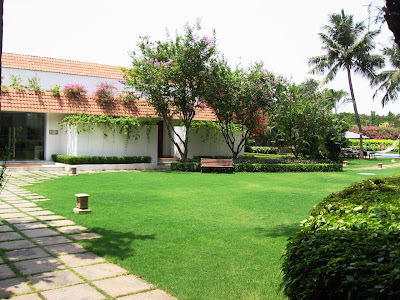 Zameendar is located in Anna Nagar right next to the Sundaram Medical Foundation. 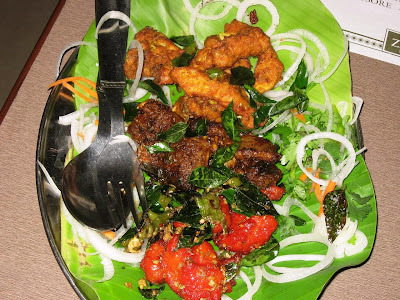 Try it out if you are here and enjoy spicy Andhra food. They have a very busy take-out counter too. 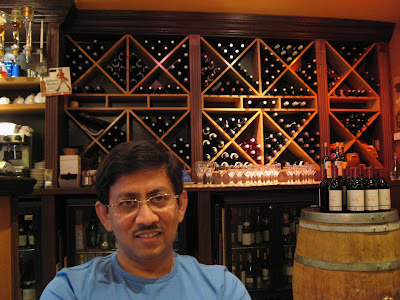 The other restaurant I visited was Annalakshmi. This is not just another restaurant, but a place that intends to marry art, culture and food into an exceptional dining experience, albeit a vegetarian one. 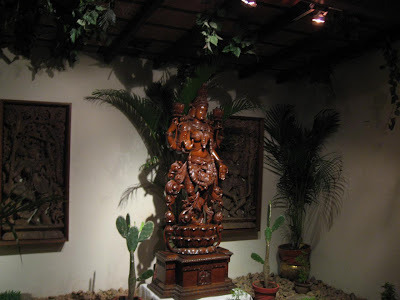 The restaurant is filled with an art-gallery ambiance and has as its centerpiece a large idol of Annalakshmi, the Hindu Goddess of abundance. The servers in the restaurant are all volunteers, who very often have other day jobs. 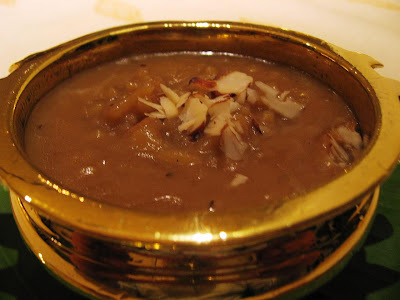 I began with a very interesting local cooler called Paanagam made of jaggery and tamarind. We ordered some of their best rice-based dishes: the Puliodharai, rice made with a specially reduced tamarind pulp, followed by the Ellu Saadham, rice flavored with crushed sesame seeds and garnished with fried peanuts and curry leaves. They recommended the Oorulai Kizhangu Kara Curry, finely diced potatoes, spiced with red chillies and garnished with curry leaves. All of them were excellent. I was so happy to taste the excellent Puliodharai again; in Mysore, where I spent my childhood, this favorite of mine was called Pulliogray. The Ellu Saadham was very good too; this was the first time I tasted this wonderful dish. 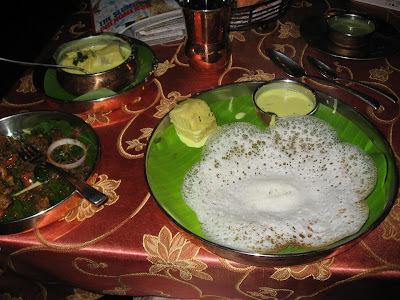 The rasam, applams (South Indian papad), and varieties of pickles that accompanied our food were awesome too; I was reminded of my Mysore days again when they got us saunf coated with colored sugar which we called 'peppermint' those days . With all that rice in us, we could barely walk out. 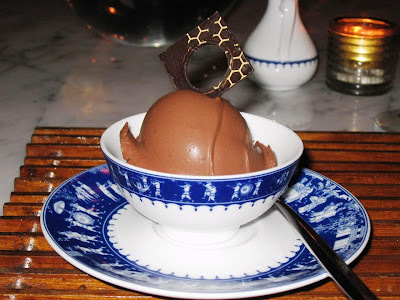 There was no way we could even think of dessert tonight! 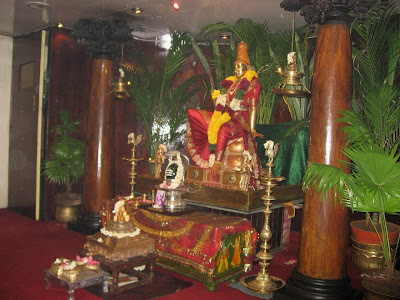 Annalakshmi is located at 804, Mount Road in Chennai. They have branches in Perth, Singapore and Kuala Lumpur too. 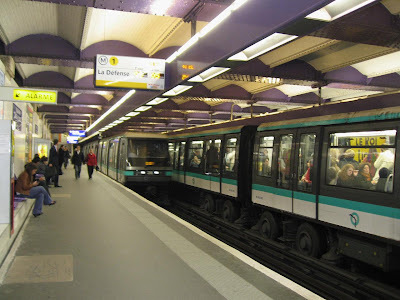 While Bangalore was very pleasant, I had no such luck in Chennai. I stepped out into the hot, humid morning at the airport and quickly made my way to the waiting car and drove to The Trident. Later in the day, I dined at the Samudra, a Indian seafood restaurant at this hotel. 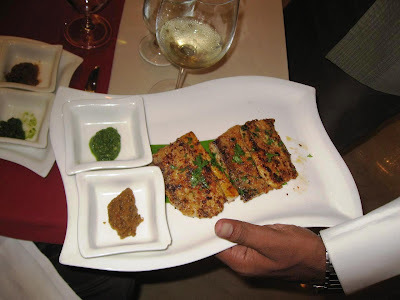 The Sea Bass Varuval made of grilled fish maninated with fresh ground pepper, curry leaves and chillies and other spices was delicious. So much so, I ordered another portion. 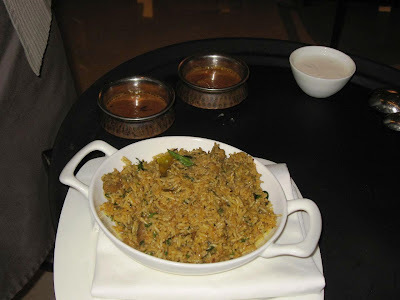 The Moplar Lamb Biryani from Kerala was good too and came with a bowl of gravy along with the raita. The Moplars are a distinct community from Kerala, who like the Chettiyars of Tamil Nadu, have been long known for their culinary traditions that was heavily influenced by the Arab traders who came here to buy Indian spices. 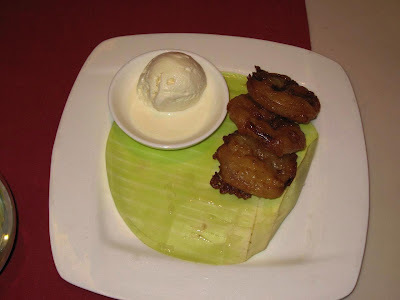 We ended dinner with some apple jalebis and ice-cream which were rather ordinary. Incidentally, the Trident has a pretty good spa with trained Indonesian therapists. 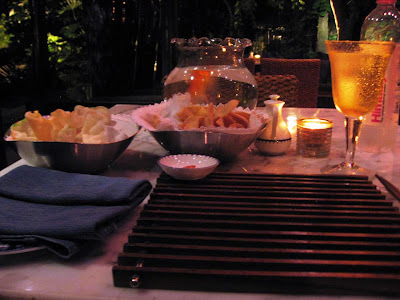 Try the Balinese massage here if you have a few hours to spare. The spa is housed in a low-rise colonial-style building on a lush green garden adjascent to the pool. Very nice! 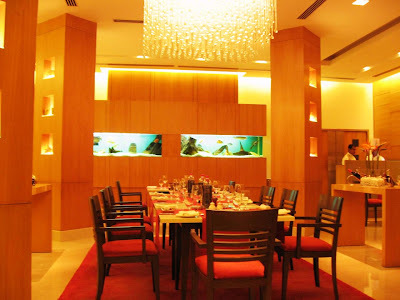 The last time I was in Chennai was in March and stayed at the GTC Grand. I have already written about their excellent Mediterranean restaurant, Azulia. Given how much I had enjoyed that experience, I decided to also try their other restaurant, Copper Point. Copper Point serves Indian cuisine and has a good selection of both North Indian and South Indian specialities. Having just come from New Delhi and a trip to the Bukhara, I wasn't going to try North Indian food here! I ordered a Kerala Pepper Chicken with appams and sat back to enjoy the live South Indian music. The interiors were decorated with shiny copper and brass utensils. On this Sunday night, the restaurant was quite crowded. 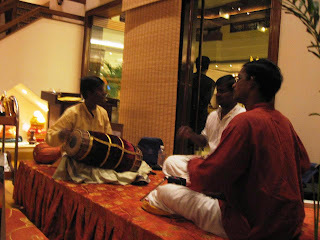 A musician was playing South Indian classical on his violin, with tabla and ghatam players accompanying him. The diners were equally engrossed in the food and the music, and the musicians acknowledged by taking requests. The chicken was succulent, fiery and spiced just right. But the highlight today were the excellent appams and the meen moilee. Made right in front of me in a live station, the appams were amazingly light and soft with crispy edges. The meen moilee, another Kerala speciality, is made of mildly flavored white sauce made of coconut milk and spices. Excellent stuff! I ordered a dessert of gulab jamuns bobbing in rabri. Unfortunately, these were a letdown. The jamuns were hard and no good at all. I should have stayed away from the desserts altogether. 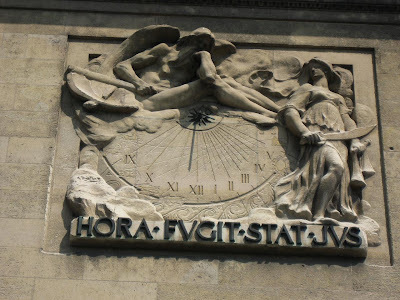 I was up early next day. I was shivering - the damn AC was on overdrive for some reason; I had to switch it off completely. 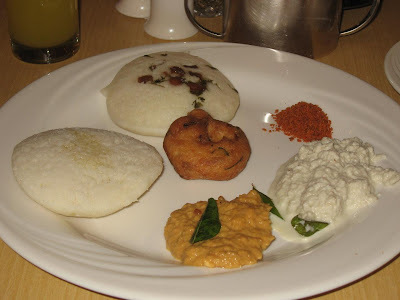 As is my usual practice in Chennai, I stayed with vadas and idlis for breakfast. While they were good, the ones at the Raintree last time were better. BTW, the GRT Grand has a pretty good gym and spa. Apparently, the Ayush spa is a Hindustan Lever venture that specializes in Ayurvedic treatments including massage therapies and body scrubs. Try it if you are here! Update: I was shocked to read in the newspaper that Saravana Bhavan's founder has been convicted for murder. Read this and tell me if you will eat their sumptuous meals again. 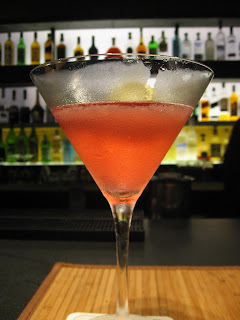 Blue Ginger is probably one of the most romantic dining destinations in Bangalore. 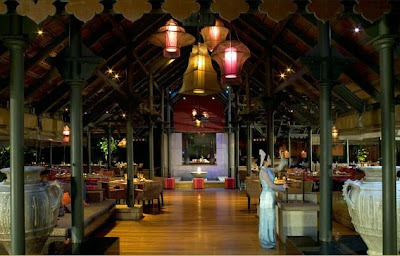 Set on an island surrounded by dense green foliage, gurgling streams, lotus ponds and frangipani trees, this outdoor restaurant serves up delectable Vietnamese delicacies in the warm, flickering glow of candle-lights and flaming torches. Located in the 100-year old Taj West End, this delightful place offers delicacies from the North and Central regions of Vietnam. I had already decided to try one of their degustation menus. 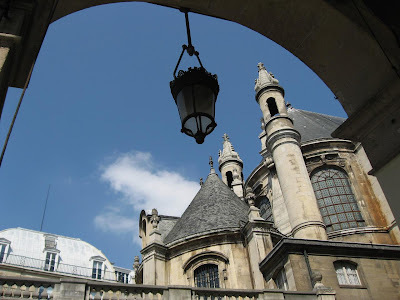 As I sipped on a Chilean red, I noticed the chic decor around me: large Vietnamese urns, silks, leather ottomans, and stone tables - all arranged around the open kitchen. Seeing me alone, my thoughtful waiter decided to do something about it: he placed a large goldfish bowl on my table, beaming widely. 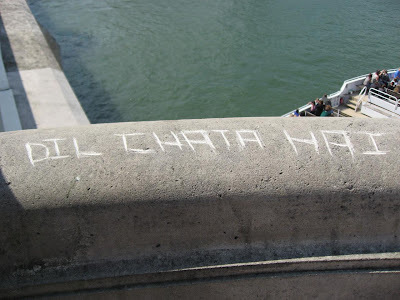 "Now you have a friend to share the evening with", he said. He was back soon with platters of wafers and my soup. The prawns in a lemon-grass chilli lime soup was tangy, hot and refreshing in the cool night air of Bangalore. Pune has been unusually hot this summer, and the pleasant weather here was a welcome change. The soup was followed by an excellent Mango and Apple salad with poached shrimp, cashewnut and mint. 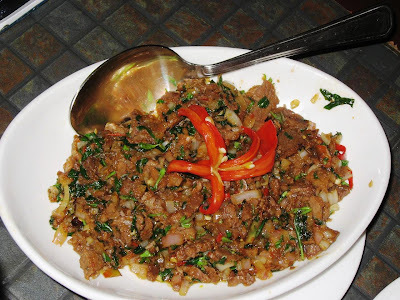 Crunchy, tangy and even more exciting than Thai papaya salad which I also like. Next came the starters, three of them on a plate in small portions. These were the highlights of my meal togight. The Scallops in Black Pepper, Garlic and Oyster Sauce was brimming with taste and the mix of textures on my palate was delightful. The Grilled Prawn in Lemon Grass and Chilly was milder but very good too. 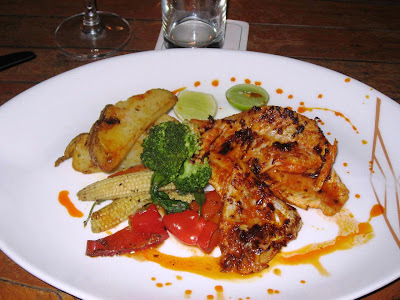 The Grilled Chicken with Cinnamon Marinade was very interesting and unusual. The entrees began with the Sauteed Lobster in Salt, Pepper and Garlic. I was amazed by how fresh all the sea-food here was; they probably fly them fresh every day. The King Prawn in Tamarind Sauce was nice and tangy. The Honey-Glazed Lamb Shank in Chilly Oyster sauce was oh-so-yummy and succulent, the meat flavorful and falling off the bone easily. The Stir Fried Chicken with dill, dry chilli and turmeric was a more ordinary end to a great meal. 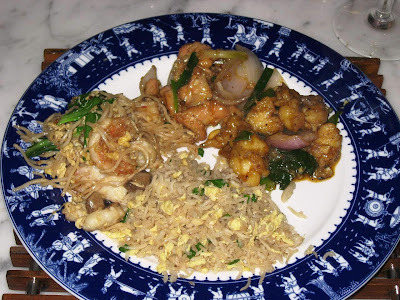 Soft noodle with seafood, an egg and crab-meat fried rice, and a stir-fried vegetable fried rice accompanied the entrees. 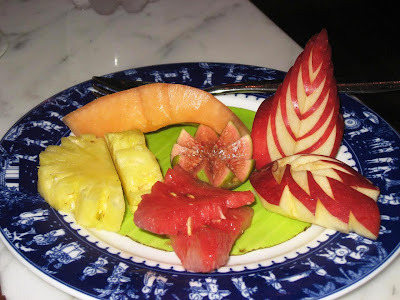 I finished off with a Chocolate and Coffee Mousse along with a platter of fruit cut in fancy shapes. Great experience, would be even better if I had some company (no offense intended to the pretty little goldfish!). Blue Ginger is an expensive place but one which can make those special occasions really come alive. 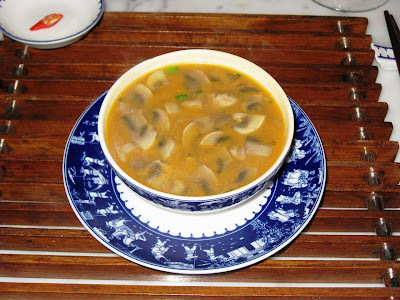 Blue Ginger is owned and run by the Tan family in Vietnam, known for their upscale Ho Chi Minh City restaurants. 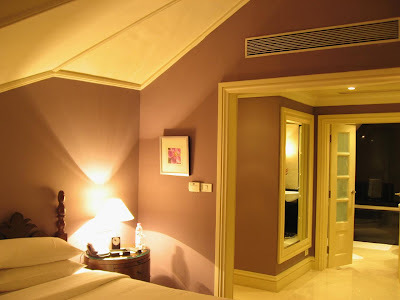 In addition to being home to Blue Ginger, the Taj West End is a wonderful hotel for a short stay. 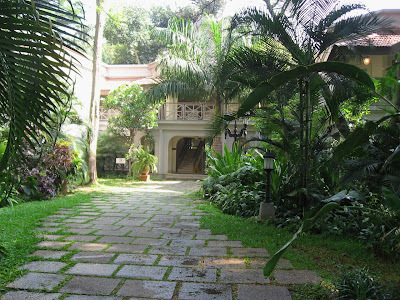 A British colonial exterior coupled with rooms in low-slung wings in the middle of lush green gardens gives this hotel a resort-likel ambiance and quietness in the middle of this bustling city. My room had slatted windows, a quaint spiral staircase leading to the bedroom on the upper level with a sloping roof. With its interesting restaurants and rooms, this hotel could be a great weekend getaway. Posts from my Vietnam trip: Arriving, Moments, Cruise, Dinner. 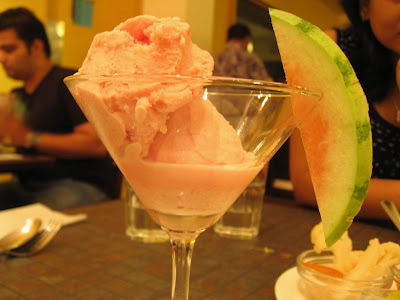 Pune's popular Southeast Asian restaurant, Malaka Spice, moved into a new - and much larger - space in Koregaon Park. Having spent the last couple of months eating European food, I was eager to get back on the spice trail, so here I was! Malaka Spice is now in Lane 5 right where Karen Anand's Merlot and Mauve once stood - neither reastaurant lasted very long. Malaka Spice, with its name recognition and die-hard fans, ought to have no such problem. The restaurant has an outdoor al-fresco option as well as an indoor section. Given the soaring heat in Pune, we took a table indoors. 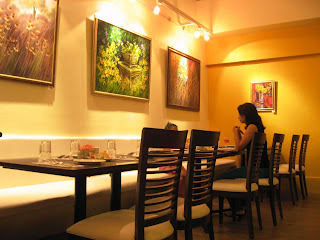 The decor is minimalist (like Indus Kitchen) but brought to life by the bright paintings on the walls. Malaka Spice has a unique concept of combining art with food. This display of works of aspiring painters on their walls are for you to admire and buy off their walls if you so desire - the prices are discreetly tagged on the paintings. They also have a caricature artist who can capture the moment on paper as you wait for your food. I only wish they had chosen a more lively or an Oriental look-and-feel indoors. 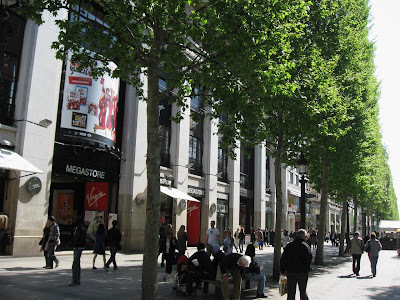 However, the ambiance outdoors is probably better, especially on a pleasant evening. 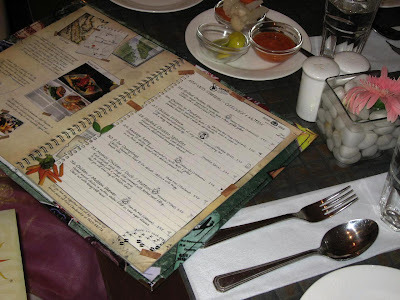 The menu is very creatively designed, taking you through a visually appealing culinary tour of the Far East. The chefs innovations have been called out with little icons - I recommend you try them. 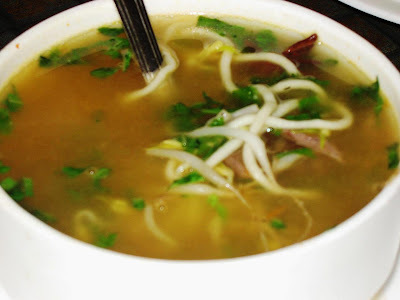 The chef's Pho Chiru mutton soup , described as a fragrant melange of star anise, basil and coriander with mutton, set the tone for the evening. The soup was flavorful, spicy and excellent! 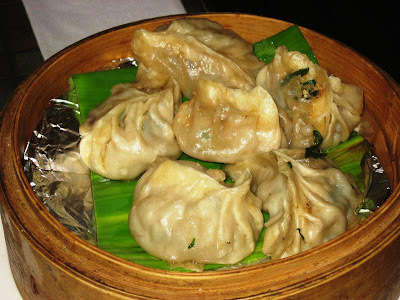 The Chicken Momos, dumplings stuffed with herbed and minced chicken, is a delicacy from the lands of the Himalayan north of India. They were delectable with the unique onion-based dip. 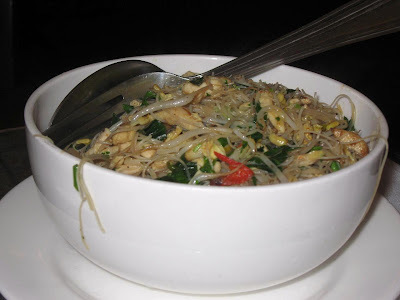 We also ordered a portion of the Thai Papaya Salad. 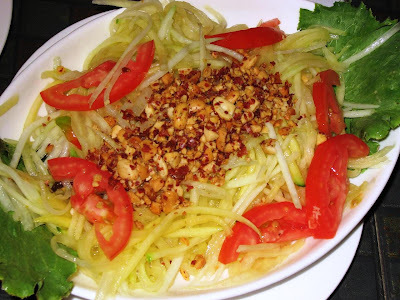 The tangy and spicy salad with shredded green papaya, chilli, lime and crushed peanuts was good. 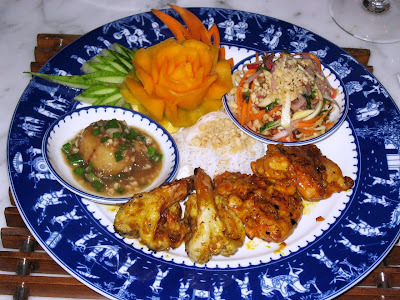 However, I have had even better at Krungthai in the Bay Area and at Baan Khanitha in Bangkok. Our starters ended with the interesting Lamb Pepesan, a tweaked Vietnamese dish by the chef. 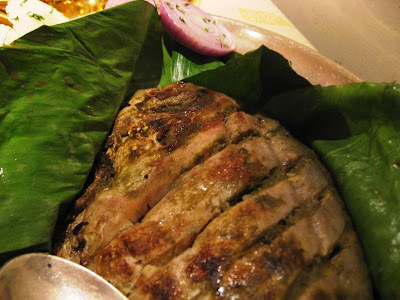 This starter of ground mutton with spices steam-cooked in banana leaves was very tangy in a nice sort of way and went well with the lime-and-chilly dip. It tastes much better than it looks (in the picture below). 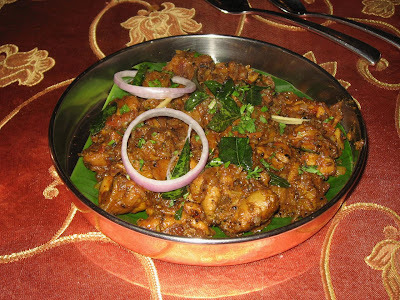 We then moved to the BaBeOS mutton - spicy strips of mutton tossed with basil, beans and oyster sauce. Other than the unusual name, everything about this entree was good. We had paired this dish with the Mee Siam rice noodles with tofu, celery shredded chicken and garlic chives. That was a lot of food, but I had to try the desserts too. 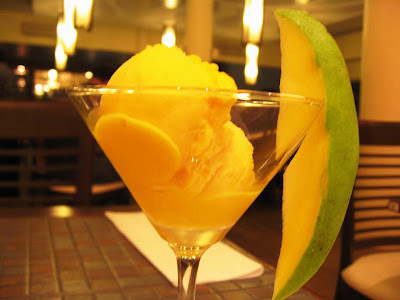 On the waiter's recommendation we picked the Mango and the Watermelon sorbets. They were amazing, especially the mango! Smooth and a particularly satisfying end a great meal. A key fixture in the Pune's dining scene for a long time, this interesting restaurant finally has the space it deserves. 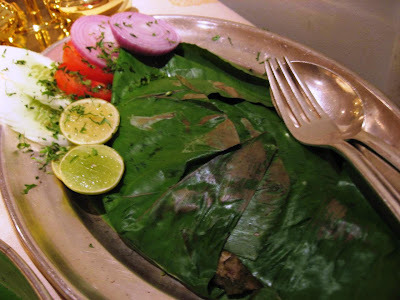 Malaka Spice is located in Lane 5, Koregaon Park, opposite Oxford Properties. For reservations, call: 9923329299, 9823064050. 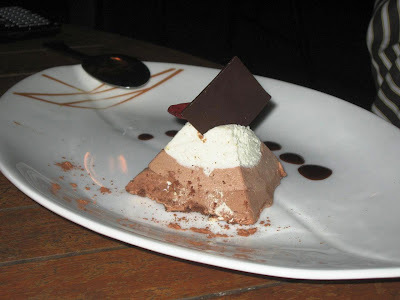 Note: Click on Pune Dining under Categories in the laft-hand side-bar of this blog to read similar posts.